All Party Parliamentary Group report on RE: The Truth Unmasked. Transforming RE: the Ofsted report into Religious Education 2007-2010. Guidance for RE 2010: This is the new guidance for the teaching of RE (but not collective worship) from the DCSF / QCDA issued in Janaury 2010. Warwick report on resources: this is the seminal report on the use of resource in RE. Warwick audit on resources: this is the audit of resources reviewed for the resources report. Access and engagement: RE and EAL: (English as an additional language): A range of ideas and strategies for tackling EAL as part of the curriculum. 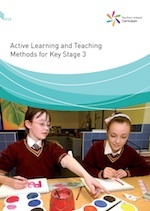 Active Learning and Teaching Methods: from the new NI curriculm this is a collection of useful critical thinking exercises. APP: Assessing Pupils Progress: A new schema set up by the government focused on the day-to-day as well as the period nature of assessment building on the AfL ideas of Black and Wiliams. A condensed Key Stage 3: (pages 79 to 90 pertain to RE): This is the document looking at the Key Stage 3 review it develops the thoughts, pertaining to RE, on the curriculum. "Can do" statements [written by Deborah Weston and Dave Francis] based on QCA levels: This is a set of child friendly statements based on the QCA curriculum and giving these to students to aid them with self-assessment and self-development. Developing curricular target setting in religious education: Helps teachers with the development of targets in RE for students to aid improved and progression. Developing objective led lessons in religious education: Helping teachers to focus on the RE objectives of a lesson and develop lessons which ensure that these objectives are met. Developing oral feedback in religious education: Helping students to think orally and to construct logical and rational oral strategies. Developing peer and self assessment in religious education: This document helps you to develop ways in which students can peer assess and self-assess. This helps develop the personalised learning agenda. KS3-GCSE progression (pages 58-61 pertain to RE): Some data on the progression of RE groups against national norms from KS3 to GCSE. Pedagogy and Practice: Teaching & Learning in Secondary Schools: Questioning: This document helps you to develop your skills in using questions in the classroom as teaching and learning tools. ICT across the curriculum: Religious Education: This document considers how ICT can be implemented into the curriculum and how the development of pedagogy which takes ICT seriously can aid and develop the teaching of RE. Interactive whiteboards and religious education: Some ideas and strategies for using your e-whiteboard more effectively for teaching and learning in Religious Education. QCA support materials: Support materials from 2000 from the QCA. Secondary RE review document: based on the Ofsted review of RE this document will aid in checking the 'health' of your RE department Starters for RE: some starter activities for RE teachers Supporting Gifted and Talented pupils in RE: this document explores a range of teaching and learning strategies for working with gifted and talented pupils. Websites for Primary RE: this is a small pamphlet looking at how website can be used in teaching and learning for primary RE.